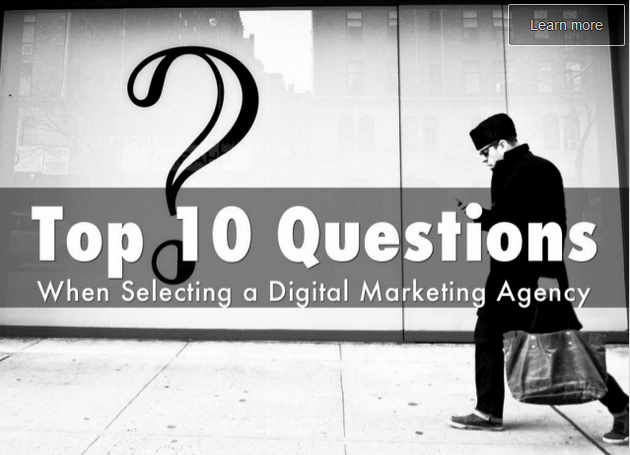 List of questions to ask the Digital Marketing Agency you are considering. Can the agency tell you which campaigns and marketing efforts are working? Ask the agency to perform a preliminary audit of your current paid and earned digital campaigns. SEO, Content, Social and PPC audit should all be a part of evaluation. After the audit, what are the untapped opportunities the agency can help you with? How will the agency and you know if a campaign is successful or not? Do these measurements add to your bottom line? Is it impressions, traffic, clicks, leads, sales? How will the agency show you if the campaign is bringing you the results you need to reach your goals? Does the agency offer complete transparency? Will you have access to your reports, Analytics, Adwords account, dashboards and accounts to show what is working? Will they tell you how much of your advertising budget goes to ad placement and how much goes to account management? What is the agency SEO strategy? What is involved in their SEO work? Is it just on-page optimization? How do they approach link-building or off page SEO? What will be the KPI (key performance indicator) for the SEO work. What is the agency Content Marketing Strategy? How does the Content Marketing integrate with your SEO and Social Media? What will be the KPI? What is the agency Social Media Strategy? How does a social media align and integrate with SEO and Content Marketing? What will be the KPI? How is the agency optimizing your PPC campaign? Will you receive regular progress reports showing you if you are optimizing your spend on paid search? What is the agency offering, deliverables or performance? Is the agency offering list of deliverables (number of blogs, hours of work etc.) or are they offering performance. What are the deliverables and how is the performance measured?